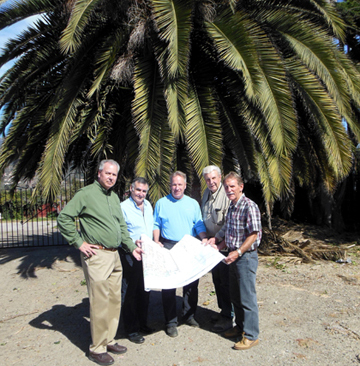 The development crew at Casas de las Flores (formerly the Camper Park) in Carpinteria reviews architecture and landscape plans for the new 43-unit affordable housing complex. The specimen date palm in the background will be repurposed and used in the landscaping of the new development. Pictured are architects Carl Schneider and Jean-Pierre Ainciart, landscape architect Rob Fowler, and Peoples’ construction superintendent Jim Hurst and senior construction director Bill Loar. Peoples’ Self-Help Housing is ready to start construction at the Casas de las Flores affordable housing complex at the site of the Carpinteria Camper Park. 43 new town home residential units will house approximately 200 low income adults and children and will remain affordable in perpetuity. The $17.3 million project has been in the making for over 10 years. In 2003 Peoples’ Self-Help Housing purchased the Carpinteria Camper Park at the urging of City of Carpinteria leaders and the community, who were familiar with the blight and negative impact the Park was having on the community. 80 families were living at the Park in very substandard conditions. During the past 10 years PSHH has made many improvements to the park: sewer system repairs, new fencing, electronic entry gates, rehab of the community laundry and bathroom facilities, site manager, after school education, and other support programs. During the past decade the 80 households living in trailers at the Camper Park have been transitioned to other housing, mostly Peoples’ 42 other affordable housing complexes, including nearby Dahlia Court II which opened with 33 new affordable apartments in April 2013. Situated on 2.5 acres, the development will include a large youth learning center with classrooms and computer lab, offices for property manager and social workers, clinic space, and community meeting room with a commercial kitchen. The complex will also include a playground, walking path, open space and bio swale area. Construction bid request for proposals were issued November 4, 2013. Construction is scheduled to begin spring 2013, and will last about 15 months, according to PSHH’s senior construction director Bill Loar. Outreach and rent up for 43 qualified low income households will begin in late spring 2014 about 3 months prior to completion in the summer 2014. The land purchases for the project were completed by Peoples' in 2003 and 2012. Peoples’ plans to raise over $500,000 in contributions from foundations, individuals, and businesses to support the Casas de las Flores project. The new residents will thrive with access to learning, on-site youth education, senior programs, ESL, financial literacy, gang prevention, college and scholarship preparation workshops, and health classes that are designed to build self-sufficiency and improve quality of life for Peoples’ low-income residents. The health of residents will be improved by access to medical, dental, and mental health services, facilitated by PSHH social workers. The lack of affordable housing remains a critical problem. SB County is one of the most expensive housing markets in the country and experiences a significant “affordability gap” between housing costs and local wages. The countywide ‘housing wage’ for a two-bedroom unit is $20.63/hour or 275% of minimum wage. Therefore 2.75 full-time minimum wage jobs are needed for a working family or individual to afford the average two-bedroom apartment. It is estimated that more that 54% of renters in the Santa Barbara-Goleta statistical area are unable to afford a two bedroom apartment. Market rents for a two-bedroom apartment currently range from $1,600 to $2,200 per month. (SB Co. Real Estate and Economic Outlook, California Economic Forecast). Peoples’ Self-Help Housing was founded 43 years ago by a group of volunteers concerned about the lack of housing for the poor and the effects of poverty on their lives. From a $2,000 loan from a local church that helped to build several self-help homes in 1970, Peoples’ has grown to become the largest affordable housing provider on the Central Coast. The mission of the non-profit organization is “to provide affordable housing and programs leading to self-sufficiency for low-income families, seniors, and other special needs group on California’s Central Coast. In 2012 PSHH permanently housed 43 formerly homeless households in its properties. PSHH has assisted 1,200 low-income families build and purchase their first self-help ‘sweat equity’ home and has developed, and now manages, over 1,500 units of affordable rental units, housing nearly 4,000 low-income and special needs residents.